AWARD WINNING SINGER/SONGWRITER/COMPOSER TIM DI PASQUA RETURNS TO THE METROPOLITAN ROOM FOR ONE NIGHT ONLY SATURDAY, FEBRUARY 19TH AT 7:00 . TAKING A BREAK FROM PERFORMING WITH THE AWARD-WINNING SINGING GROUP “SOUTHERN COMFORT” WITH TOM ANDERSEN AND SCOTT COULTER, AND MUSICAL DIRECTING JIM VAN SLYKE IN THE CRITICALLY ACCLAIMED “THE SEDAKA SHOW ” CELEBRATING THE MUSIC OF NEIL SEDAKA, WITH MR. SEDAKA HIMSELF, TIM RETURNS TO WHAT HE DOES BEST; SINGING HIS OWN SONGS. JOINING HIM ON STAGE WILL BE JENNIFER ZIMMERMAN (PHANTOM OF THE OPERA) AND TRENT ARMAND KENDALL ( FIVE GUYS NAMED MOE, INTO THE WOODS, BAT BOY , PICTURE INCOMPLETE). 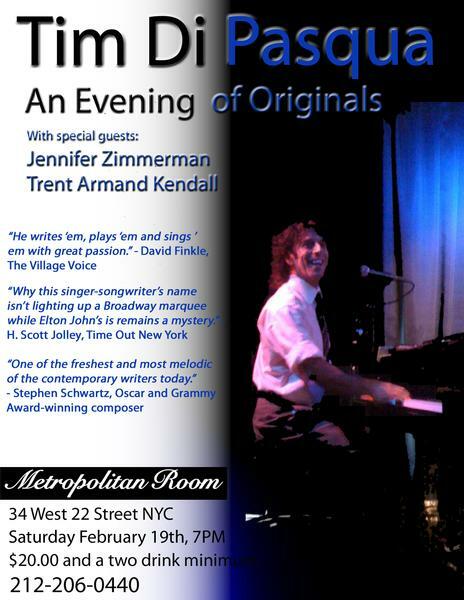 IN ADDITION TO PRESENTING SOME OF HIS CLASSIC SONGS LIKE “YOU”, “MONSTER UNDER THESE CONDITIONS”, AND “ ONE THING” TIM WILL BE OFFERING SONGS FROM HIS MUSICAL REVUE “NOTES ON NEW YORK ,THE MUSICALIZED OBSERVATIONS OF TIM DI PASQUA” AS WELL AS A FEW BRAND NEW SELECTIONS.